There’s nothing that quite compares to exploring a beautiful city from the seat of a bicycle: You can feel the breeze on your face as you roll smoothly through the bustle of the city. With Chattanooga’s comprehensive Bicycle Transit System, you can get this exciting experience without even having to bring along your own bike. By renting a bike for a short trip, a day, or a weekend visit, you can explore the Scenic City’s many eclectic neighborhoods from a unique, two-wheeled perspective. The Bike Chattanooga Bicycle Transit System was created with the goal of offering locals and visitors a fun, convenient, and healthy way to travel, while building a community of cyclists all over the area. With more than 300 bikes available every day of the year, Bike Chattanooga is an excellent option for both short trips and sightseeing excursions. A 24-hour pass costs just $8 and allows unlimited 60-minute trips within that time. For weekend cyclists, a three-day pass costs $15 for as many rides as you want, while residents can purchase an annual bike share pass for only $50. Bikes can be rented from and returned to any of the 37 solar-powered stations that reach all corners of the city. Each station has a kiosk with a map of the city and locations of other docking points. The bikes themselves have lights, step-through frames, and front racks. The bicycles are regularly monitored and maintained by Bike Chattanooga staff, and stations are easy to find and use. Here are few excellent places around Chattanooga to delve into your biking adventure. This area on the northern side of the Tennessee River is teeming with boutiques and restaurants for visitors to explore. Northshore is also home to two beautiful riverfront parks— Coolidge and Renaissance—that are fantastic for some light bicycle cruising on a sunny day. You can pick up a bike in either of these parks to begin your Northshore excursion. Don’t miss local shops such as Blue Skies, and remember to stop in for a homemade ice cream cone at Clumpies Ice Cream Co. or a drink at Beast + Barrel. The Riverwalk is Chattanooga’s 8-mile paved recreation path that stretches from the Walnut Street Pedestrian Bridge all the way to the Chickamauga Dam. The pathway has a continuous view of the sparkling Tennessee River, and its minor elevation change makes it easy and accessible for almost anyone. Along the way, you can enjoy playgrounds, picnic tables, restrooms, and water fountains. Three bike share stations along the Riverwalk allow you to explore the popular path with ease. Chattanooga’s artsy Southside neighborhood is quickly coming alive with trendy bars and coffee shops, making it the perfect place to take an urban bicycle outing. Seven bike docking stations in this area means you’re never too far from a place to stash your bicycle. For a fantastic cup of coffee and a homemade pastry, stop in at Niedlov’s Breadworks, or check out the beer selection and amazing architecture at the Flying Squirrel. If you’re visiting on a Sunday, cruise on over to the First Tennessee Pavilion and browse the Chattanooga Market for locally made crafts and cuisine. Located in the heart of downtown and near the University of Tennessee at Chattanooga, the MLK area is a blossoming neighborhood that offers a lot within just a few blocks. Pick up your bike at Miller Plaza, where you can enjoy free events or a casual urban picnic before heading east on MLK to discover its unique bars and restaurants. Make sure you take a trip all the way around the block to admire the colorful, larger-than-life mural that encompasses a nearby building. To best explore one of the most vibrant areas in Chattanooga, grab your bike at the Visitor’s Center on Broad Street. Right there, you can enjoy a fun family outing at High Point Climbing & Fitness or grab a meal at Chattanooga’s famed Big River Grille and Brew Works. 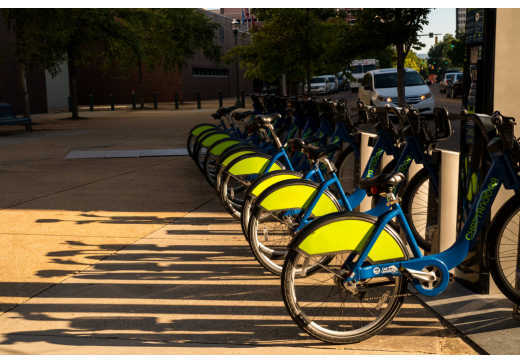 From there you can take a short ride over to the Tennessee Aquarium and explore its open courtyard, or cruise down Broad Street to find your new favorite restaurant using its wonderful protected bike lanes. Don’t forget to stop in at the MoonPie General Store to pick up your Chattanooga souvenir. For your bike tour of Chattanooga’s art district, you can pick up a bike on either side of the Walnut Street Bridge, depending on how far you want to ride. On the southern side of the bridge, you’ll encounter a modern glass ramp that will lead you to the steps of the Hunter Museum of American Art. If you don’t have time to go inside, you can admire the sculptures that populate its large front lawn. Stop in at Rembrandt’s for coffee and pastries and stroll on over to the Sculpture Garden for a self-guided tour. For local artisanal cuisine, you can visit Tony’s Pasta Shop & Trattoria, the Back Inn Cafe or the Bluff View Bakery. From here you can hop on the Riverwalk or head back to downtown.